I'm thinking about a tour build, hoping for a list of specific components that will use a 105 triple, and result in a 24 or 22 inner ring, and a 34 or 36 in back. Is this do-able? I'm looking for the lowest granny a 105 can handle. Thanks for taking the time to reply. I figure the Mechanics crowd would be able to help you more with the nuts and bolts of your spec sheet. I think you'll find a lot of tandems run road triples and mountain rear derailleurs using STI shifters, so it's definitely possible. I think the norm is 105 shifters with a 105 front derailleur, with road triple of your choice. XTR 9-speed rear with up to 34T cassette of your choice. Note that 10-speed mountain does not work with 10-speed road. standard calipers, cantilevers or road disc brakes. you might be able to get a mountain type front derailleur to work with 105 shifters... not sure 100%. that would allow you to get down to the 24T granny inner. The issue that I'd anticipate would be the upshift from the granny to the middle ring. You might find yourself shifting to the big ring and back down. That wouldn't be a deal breaker for me. SLX M662 or XT M771 RD <-- make sure these are 9sp compatible, 10sp mtn RDs won't work with the 105 10sp shifters. Last edited by mconlonx; 08-05-14 at 07:37 AM. I would not go down to an 11 tooth cog, even with a 48 tooth front. You already have quite a wide range, so why make it worse? I personally would go with a 13, but 12 would be at least a bit better. A few questions first. What are the chain ring sizes on the 105 triple you now have? How much weight are you planning to carry? What distances do you foresee? What is the terrain likely to be? Up shifts from the Granny would take place at the crest of the hill .. I personally have no need for, STI but many would not go without..
so trim after shifting approaches the user control of friction shifting..
to reduce the chain scraping the FD chain cage. ....you might be able to get a mountain type front derailleur to work with 105 shifters... not sure 100%. No need for an MTB front derailleur and it won't work with road STI's, particularly on a triple. The standard 105 front derailleur is correct for the big chainring's curvature (50T on current FC-5703 cranks) and will easily handle a 24 or 26T replacement granny ring. I have two FC-5703 cranks on my bikes and the 26T granny works fine. As noted, the shift from the granny to the middle is a bit sluggish but you will almost never be in a hurry for that one. The STI is about Total Integration .. the best performance is leaving the whole thing as designed ..
putting a smaller granny gear on will shift a bit slower.. . but can be coped with..
read the terrain & anticipate the shifts. For a double crank you can often make an MTB front derailleur work adequately with road STIs since the limit screws act as travel stops. For a triple crank having it work is much more iffy as the cable pull requirements are quite different. 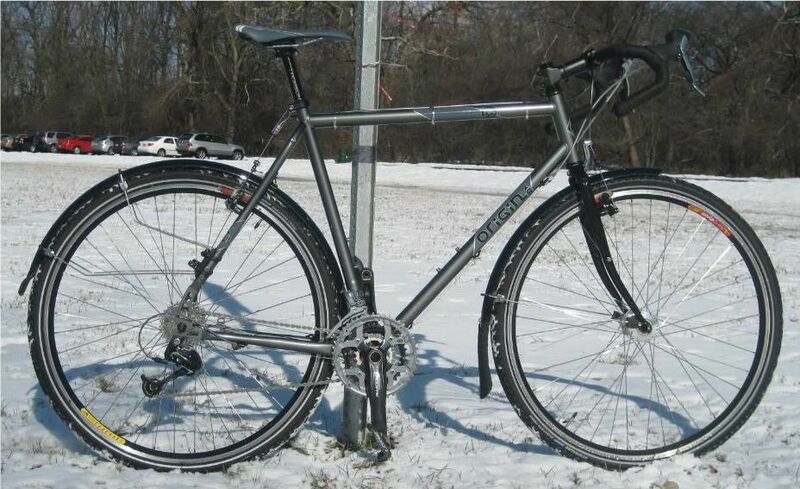 Years ago I "roadified" an early 90's Trek MTB that had LX components and a triple crank. The 8-speed triple 105 STIs shifted great in back but would not index at all well in front. I wound up using a left-side bar end shifter for the front derailleur. When touring, you're not likely to need or want higher gears than you use when commuting, being that you'll want to conserve energy. Depending on your fitness, you may not need much more than a wide-range cassette since 100k/62mi per day should allow for ample rest time each night, and a leisurely pace during the day. I think you're going to need to gear down the drivetrain to accommodate what you'll face on the trip. Your cassette choices are good, but I'm not a fan of an 11T top. Using a 12T top will put a cog in the mid range that will serve you better, more often. To run STI levers you'll need to use a road front derailleur, and a non Dynosys mountain rear derailleur for any road group indexed rear shifting. I use a RX100 (now Tiagra) on my STI bike with a 24-34-42 Sugino Impel crank set. It works just fine, but I also maybe lucky. Not a premium crank set by a long shot, but it's inexpensive and is spec'd for a 113-115 mm bottom bracket, mine's working with a 110 mm BB. For the rear derailleur I have an older LX and an 11-28T 7S cassette. 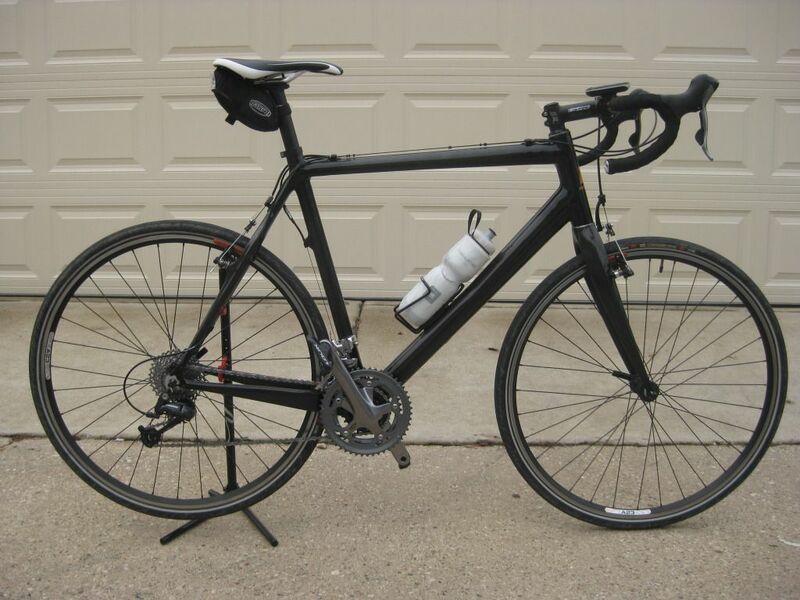 This isn't my primary touring bike and isn't geared as low on the bottom as the primary bike. 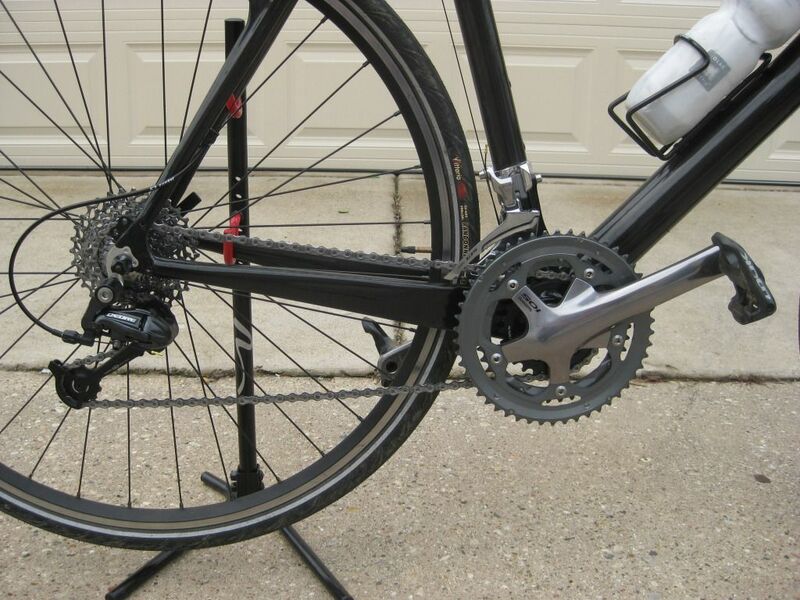 A 48-38-28 triple crank set will work fine with the above, even on steep grades. The 48-12 combo will get you along at a good clip downhill or with a strong tail wind. I'm running a 50, 39 & 26 chaining set with my 105 crankset and a 11-32 cassette on my light touring bike. The bike has 425mm long chainstays and two attachment eyes for a rear rack and fender. 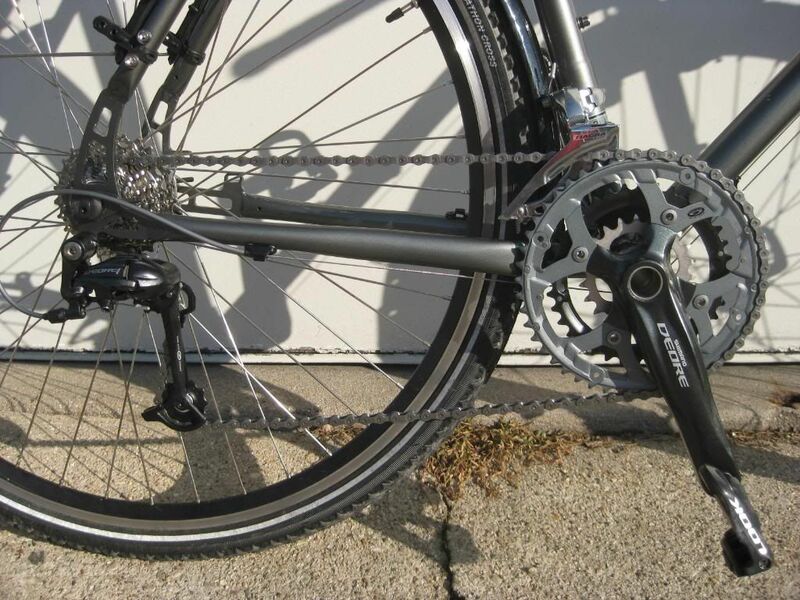 I'm also using a 48, 36 & 22 chaining set with my Deore crankset and a 11-32 9-speed cassette on my heavy touring bike. Both work well. Last edited by Barrettscv; 08-06-14 at 09:59 AM. use a 105 triple, and result in a 24 or 22 inner ring, and a 34 or 36 in back. I ran 22X36 on a gear calculator. That results in a ratio that would produce 5mph at a 100-105 cadence. I've been wondering, just how slow can you go. I'd fall over. I'm just trying to get an idea of how far the low end of my utility bike can go. I think most folks can still ride okay at about 3 MPH. There is a point where it can be easier to just walk a bike. Bikes: 89 Raleigh Technium PRE, 92 SP 1000 ti, '09 Team Pro, 72 International, 63 Hercules 3-spd, '81 Vitus 979, 2 Kabuki Submariners, 2 C. Itoh Submariners, Gary Fisher Big Sur, Skyway 3-spd, Robin Hood w/ S-A IGH 5 speed. One time when I had a flat without repairs on board I walked about 4 miles home with the bike. The computer was reading 3 1/2 to 4 MPH! I have been down to 4 mph on a 20% grade in my lowest gear 30-30. I expect that walking speed was on a relatively flat road. You could not walk that fast up a steep hill particularly while pushing the bike. When people say they can walk faster than they can ride up hill, they aren't comparing the same conditions. My cannondale came stock with a mountain rear derailleur (have to check the model when I get home) and triple front, but it only went down to 30, and I have either an 11-34 or an 11-36 at the back on my touring wheels (currently using open pros for day to day riding around, It's somewhat road-ified at this point). I've got STI's on the 9 speed drivetrain, it came with them from the factory, and I really like the ease of use... originally tiagras, now ultegras, and while I can't properly trim the inner and outer ring, I can definitely trim the middle ring back and forth at least a partial click to reduce rubbing in the mid-low/mid-high gear combos. To concur just a bit with the poster above, 22/34 means you are turning the pedals about 1.5 times per rotation of the wheel... for non-loaded use I found the 34 just too much low gear for riding around on most roads, though with a heavy pile of gear, I can't really see 30/34 not being enough for most conditions. What sort of situation are you expecting to encounter where this combo might be required? You are quite correct. The only hill I had on that walk home was about 4-5% for about 4 blocks. It didn't slow me down any. I usually do 12 -14 MPH on the bike on that same hill by the time I get to the top.